The authors (Pilfold, Stirling, Derocher and Richarson, 2015, in press) selected an area for their work (Fig. 1 below)1 that spans portions of two IUCN-defined polar bear subpopulations in the Eastern Beaufort Sea (Southern Beaufort and Northern Beaufort, see post here on recent boundary change made by Canada). Figure 1. Area of the Pilfold et al. (2015) study in the eastern Beaufort, Canada, Fig 1 in the paper. The region encompassed part of the “Southern Beaufort” and the “North Beaufort” polar bear subpopulations. Astonishingly, although thick, highly deformed spring ice conditions are known to have been a critical factor in the repeated starvation events experienced by polar bears in the eastern Beaufort Sea on a decadal basis (going back to the 1970s and before), the authors considered only sea ice concentration (% of ice coverage) available in spring. 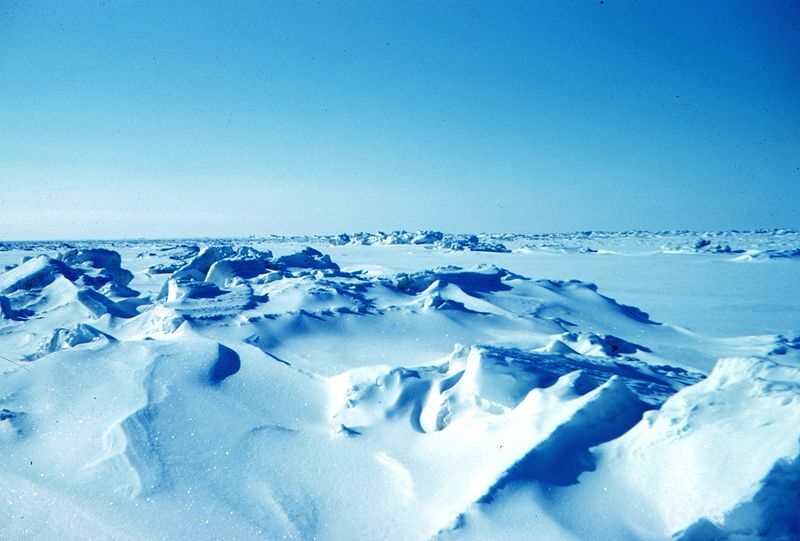 And although they did consider the state of the Arctic Oscillation (AO) – an Arctic-wide index not specific to the region (they said: “During negative AO winters, ice is generally thicker, resulting in colder spring temperatures and delayed melt”) – they included no references to support their implied suggestion that the condition of the AO fully explains regional conditions in the eastern Beaufort i.e., the development of thick, heavily buckled ice conditions that develop every 10 years or so in this region but not in others. Instead, here’s what they’ve done with the AO connection – they suggest that recent extremes of the AO (e.g., extreme negative values producing cold winters and thick spring ice) could be blamed on global warming. Pilfold and colleagues’ attempt to model a link between the 2004-2006 polar bear decline in the Southern Beaufort to global warming, while ignoring the virtually identical 1974-1976 event that occurred before much warming had occurred — similar to what Stirling and colleagues attempted to do in a previous (2008) paper — is scientifically unsound and unsupported. So much for the value of peer review. If sea ice experts and atmospheric scientists had been able to link the development of thick, buckled spring ice conditions in the Eastern Beaufort to global warming — and then to starving polar bears — I am absolutely certain we’d have heard about it by now. The fact that they have not indicates that these polar bear biologists are grasping at straws to connect recent polar bear population declines in the Southern Beaufort to global warming while ignoring identical prior events. Could it be that the publication of this paper had something to do with the fact that PBSG biologists need many bits of “evidence” to include in the model they need for their 2015 IUCN Red List assessment (due in June) so that they can continue to predict a dire future for polar bears because of global warming? [note that all co-authors of this paper are IUCN PBSG members]. Predation is an ecological interaction influenced by abiotic and biotic factors acting on multiple temporal scales, yet multi-temporal comparisons are rare in empirical studies. For polar bears Ursus maritimus, the physical configuration of the habitat and conditions in which seals are hunted may change on intra- and inter-seasonal scales. Additionally, while the effects of climate change on polar bears have focused on linking reductions in sea ice to body condition and survival, the potential changes to on-ice hunting conditions have not been examined. 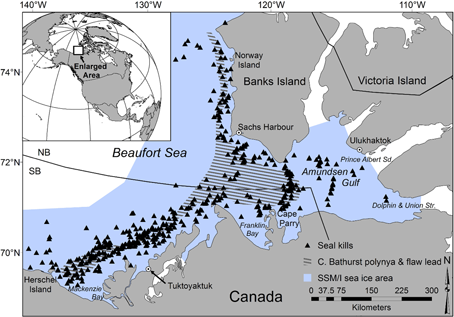 Employing observational counts of seals killed by polar bears between early-April and late-May 1985–2011 (n = 650), we modelled the likelihood of predation events in the Beaufort Sea, Canada at multi-temporal scales. We used the top model to estimate the expected kill rate of seals in the springs of 1985–1986 and 2005–2006 and integrated the result with fasting rates derived from physiological markers in blood samples. A log-likelihood ratio test suggested a multi-temporal approach fit the seal kill data better than any single scale alone. Predation events were influenced by ringed seal Pusa hispida reproduction and haul-out behaviour, regional sea ice concentration and the phase of climatic indices. The expected kill rate from the top predation model and the estimated mean biomass of seal kills were significant predictors of polar bear fasting rates. Results suggest that 50% less seal biomass was killed in 2005–2006 than in 1985–1986, which correlates with a significant increase in the frequency of polar bears in a fasting state. We propose that the documented changes in polar bear fasting rates between 1985–1986 and 2005–2006 are due to a complex set of abiotic and biotic factors including underlying prey dynamics, rather than a single-scale environmental correlation. This entry was posted in Advocacy, Life History, Sea ice habitat and tagged Beaufort Sea, climate change, Derocher, Eastern Beaufort, extinction, feeding, future, global warming, IUCN Polar Bear Specialist Group, models, Pilfold, polar bear, population, predation, predictions, Red list, ringed seals, Southern Beaufort, Stirling, thick spring ice, threatened. Bookmark the permalink.